This book covers current versions (up through Delphi XE7) as well as previous versions of Delphi. There is also an accompanying download with source code which you can download from this page. Publish date: January 7, 2015. If the book is not yet available from Amazon in your country, you can buy this book directly from CreateSpace (Amazon's publishing company), and have it shipped to your address. Note from the editor (Anderson):The pdfs include footnotes that include copyright notices and descriptions of where to purchase this book. The footnote does not appear in the printed book. You are welcome to include these pdfs on your site as long as the copyright footnote remains. The examples described throughout this book are included in the code download. You will see notes throughout the text referring to either the project or folder that contains the project file. The code download is a compressed file named cdscodeparadox.zip or cdscodeinterbase.zip. The cdscodeparadox.zip file contains sample projects that employ the Borland Database Engine (BDE) and Paradox tables. By comparison, cdscodeinterbase.zip holds code samples created using FireDAC and an InterBase database. Refer to this book's Appendix A in the section, Code Samples, for details on using the code samples and where to place them (and appropriate directory paths for various versions of Windows). Note that the InterBase samples only work with Delphi XE5 and later versions. 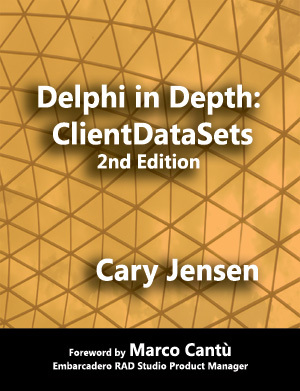 See Cary Jensen in person, along with Delphi guru Nick Hodges, at one of the Delphi Developer Days events in 2016. Delphi Developer Days are two-day live Delphi events that provide you with the latest information on Delphi as well as practical techniques to help you improve your Delphi development skills. Delphi Developer Days includes Cary and Nick presenting both joint in-depth sessions together, as well as in simultaneous tracks, where they break out into separate rooms to present on diverse Delphi topics. All attendees receive the Delphi Developer Days course book, containing several hundred pages of material presented during all sessions. This white paper is designed to familiarize you with LiveBindings. Here you will learn how to link controls in both VCL (visual component library) and FireMonkey applications using LiveBindings. I also examine the role of the expression engine, which will include a look at expressions and scopes. to link controls in both VCL (visual component library) and FireMonkey applications using LiveBindings. I also examine the role of the expression engine, which will include a look at expressions and scopes. Copyright © 2015-2016 Jensen Data Systems, Inc.
Delphi is a registered trademark of Embarcadero Technologies, Inc. in the United States and other countries.